In this post we are going to look at Apache Tiles 3 integration with Spring MVC. Apache Tile is one of the oldest template system used in Java based web application. 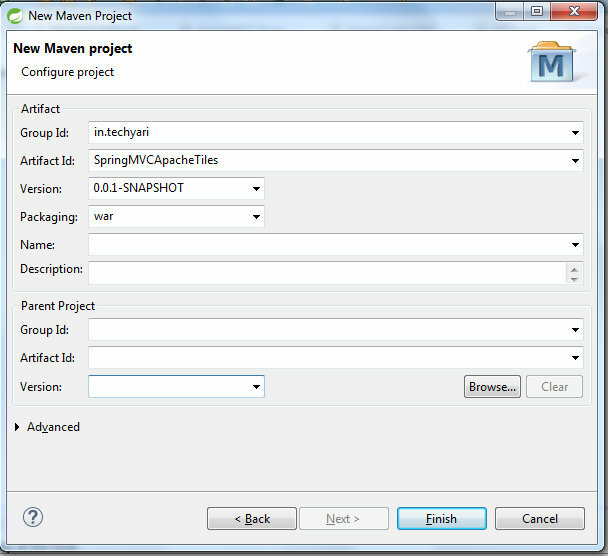 We will use Spring MVC's annotation based configuration to integrate Apache Tiles 3 with Spring MVC. I ahve also used bootstrap in the main JSP file to make it look better. You can download the source code and try it yourself. If you don't have development environment setup, you can check my previous tutorial (http://www.techyari.in/2015/06/getting-started-with-spring-mvc-tutorial-using-annotation-based-configuration.html ) for setting up development environment using all the tools mentioned above. Create following folders inside WebContent folder. first create WEB-INF/views/jsp, and then three more folder inside jsp i.e. layouts, templates and tiles. You can refer the screenshot below to understand more..
Now we need to create definations for our pages, since this is just a tutorial lets have two pages, a Home page and a Products page. We will create a defination for both of them using tiles.xml and products.xml. Create these tiles inside tiles folder. Don't worry about the jsp files mentioned here,we will create them later, important thing to see here is how we map the String value for title and the templates for header,body and footer. You can also create a base template and extend from it in a similar way, look at Apache Tiles 3 documentation for more information. Header and Footer jsp's will be used on both the pages. Welcome file will be used for homepage and Products will be used for Products page. This will include our main menu. don't worry about code here it's just bootstrap html, for showing a navigation menu, copy and paste it directly. We will create a simple footer with copyright info. The last jsp file will display products from our application database. It uses JSTL to display each product from an ArrayList list of product. We will create those file as next step. 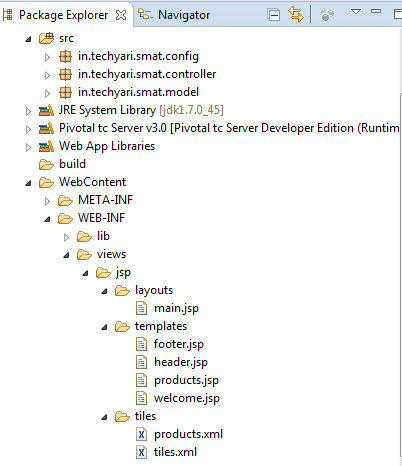 Now create a class called MyAppConfig inside in.techyari.smat.config folder, this class will integrate SpringMVC and Tiles 3 along with other required annotations like configuring our base class to look for controllers to resolve URI mappings, refer below code..
Now create a new class called Product inside in.techyari.smat.model folder, this will be used later to create an arraylist of products. That's all, we have successfully created a web app with Spring MVC and Apache Tiles 3. Run the app and see the result. Share your thoughts and comments below.